Ideas are flying around City Council as we approach the May 15 primary, including a bill co-sponsored by Councilman Bill Greenlee and Jim Kenney to be introduced tomorrow that would ensure "prevailing wages" and benefits are paid to service workers at any future development in the city that is built with financial assistance from the city. Also tomorrow, Juan Ramos will hop on the burn down Racist Skelator, er, Don Imus, bandwagon. Ramos, who faces a double-digit field of at-large candidates, including one with his same last name (Benjamin Ramos), is introducing a resolution that calls for Imus to either resign or be fired. The resolution — about as binding as the one calling on the U.S. armed forces to leave Iraq — calls for a boycott of Imus' nationally-syndiated show until he resigns or is fired. 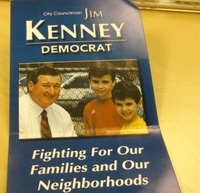 I'm not sure how old this picture of Jim Kenney is, but make sure to note what appears to be an early 90s model Chevy Cavalier in the background (an '85 Cavalier was my first ride). The adidas logo on the taller boys shirt does confirm that this has to be from at least the mid-90s, if not later. While on the at-large Council topic, there's a forum scheduled for Saturday morning sponsored by Philly For Change at the FIrst Unitarian Church. It's at 11 a.m.
Milton Street, my friends, is officially on the ballot in the at-large Council race. The elections bureau reports that Street survived his signature challenge today and, barring an appeal, will be on the May 15 ballot. A few cases are still being heard (including against Sheriff John Green and eighth-district Council candiate Maurice Houston), but here's the list of the candidates ousted from the ballot after the first round of hearings. Appeals are possible. Damon K. Roberts withdrew his financial disclosure form challenge against Council President Anna Verna at the 11th hour last Friday. Verna's attorney gave him a supplementary form with the same time stamp as her original filing which included the information in question, including her position on several boards. I went to speak to the Council President to explain to her the situation, why I had filed suit and why I had withdrawn it. She agreed to see me right away. I explained to her it was nothing personal. She said that she could have challenged my petitions, but didn't. I told her there was nothing to challenge. She said she didn't think I had a shot for now. She said that she wasn't going anywhere and that I might be a good choice for the future. "Now's just not the time," she said. "We'll see", I replied. I wished her the best and excused myself. Inwardly, I was pissed that the first time the Council President was really acknowledging me was with me giving a groveling and unnecessary explanation. Nominating petition challenges will begin this morning at the city’s election bureau. Four hearing rooms in the Riverview Place building on Delaware Avenue at Spring Garden will hear challenges to about 30 candidates for mayor, City Council, traffic court and city commissioner. Here are the list of candidates up for challenges today. The main Brady challenge (from Tom Knox’s supporters) won’t happen until next Tuesday in front of Luzerne County Judge Patrick J. Toole Jr. probably next week. He faces a challenge from Milton Street today. And, while you're waiting for Brady's case, go ahead and read this analysis from State Rep. Mark Cohen. He's the one who pushed through the language into state law (in 1989) that will be at issue here. One of the first things you learn at Metro is how to write brief. Get all the info in there, but get it done in 300-350 words or less. At one of the city's Weeklies, not so much. Take City Paper's 5,000-plus word tome on the progressive movement in the city published in Thursday's paper. Doron Taussig writes what may be the most up to date encyclopedia you'll find about the movement in the city, which has yielded a batch of City Council candidates in this election. There's a lot in there, but my favorite passage is this one, describing what Anne Dicker says was her "get off the ballot" visit to Vince Fumo's South Philly office. (The Transformers graphic is awesome, too, of course). Vince Fumo's bunker at 12th and Tasker streets is in the basement of what looks like an average row house. To gain entry, you pass two receptionists — one on the standard-looking first floor, the other at the bottom of a flight of stairs behind a pane of glass. You enter a room with red carpeting, where walls are lined with editorial cartoons about the Vince of Darkness, and mounted animals — grouses, fish — that Fumo has killed. Shortly after launching her state House race, Dicker was called here. She made the downward journey flanked by several allies, and came upon Fumo, seated behind a large CEO-style desk, pale as ever, wearing a big ruby ring. "This is the part where my life gets surreal," Dicker remembers thinking. "Am I gonna have to kiss that?" Fumo gave a brief speech to the group. They were just like he was, he said: eager, ambitious. But they had to learn to wait their turn. He instructed Dicker to drop out of the race. "I just said, respectfully, 'I'm running,'" Dicker recalls. But she was thinking, "My God. We've got to destroy these people." Nominating petition challenges will begin this morning at the city’s election bureau. Four hearing rooms in the Riverview Place building on Delaware Avenue at Spring Garden will hear challenges to 35 candidates for mayor, City Council, traffic court and city commissioner. Here are the list of candidates up for challenges today. The main Brady challenge (from Tom Knox’s supporters) won’t happen until probably next week. He faces a challenge from Milton Street today. There are sure to be those calling out Damon K. Roberts for his decision to challenge Council President Anna Verna. He was one of the reform candidates who lined up in front of the city's election bureau last Tuesday and called for an end to frivulous ballot petition challenges. The candidates reserved the right to challenge for fraud and gross errors. I'm sure you'll hear the getting his cake and eating it, too line. Whether that's a legitimate dig will depend on how legitimate you find his arguments against Verna. Roberts says Verna failed to report that she's a United State Electore (can someone share what this is? ); or that she serves as a member of various boards on institutions including the Franklin Institute and Art Museum. Verna aide Tony Radwanski said Verna hadn't seen the complaint and couldn't comment, and that he believed her board seats were mainly ex officio. Verna fails to list that she receives income from her husband's Verna Funeral Home. She also doesn't list any creditors. The challenge against Ninth district Councilwoman Marian Tasco hinges on her financial statements, and charges from opponent Raymond T. Jones that she failed to list sources of income. Jones' challenge says that Tasco didn't disclose any sources of income (even though she states she is a Councilwoman). It also questions $14,000 in payments made to an American Express card by Tasco's political committee. The payments are all listed as business expenses for Friends of Marian B. Tasco, however. I'm not sure how far this one will get. 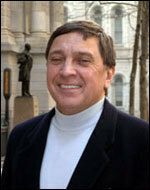 Jones is the co-founder of Men United for a Better Philadelphia. The roles have reversed in the first district Council race. Instead of challenger Vern Anastasio facing a challenge, Councilman Frank DiCicco will be forced to go before a judge to defend his place on the ballot. Anastasio (his people say they have no connection with the challenge from South Philadelphia resident Nicholas A. Williams) was booted from the ballot in 2003 for a mistake on his financial disclosure form. Now, DiCicco is under the microscope. The challenge against him filed Tuesday says he incorrectly listed his ownership in a rental property since given to his sons. DiCicco transferred the apartment building on Federal Street last June, but didn't report any income from the property earlier in the year, according to the challenge. It's the same property that was mentioned in the indictment against DiCicco patron and state Sen. Vince Fumo, which said that workers from Citizen's Alliance for Better Neighborhoods did work on the property on company time. The work included snow removal, floor installation, and moving appliances. Those things should have been reported as gifts, according to the challenge. (DiCicco is not charged or mentioned by name in the indictment. He said he thought the Citizens' Alliance workers were there on their own time). The challenge also takes DiCicco to task for not listing his membership on the Delaware River Port Authority, Pennsylvania Convention Center and Penn's Landing Corp. boards.